France’s debt level is high, and it is growing. 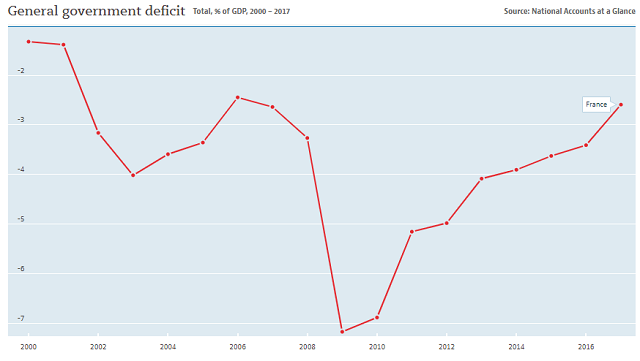 Under the Maastricht Treaty, the government is obliged to keep its annual budget deficit below 3% of GDP. As the graph below from the OECD shows, the government rarely keeps to that target. Who manages France’s national debt? The French Finance Ministry is ultimately responsible for the national debt. The government department is officially called Ministère de l'économie et des finances, which means Ministry for the Economy and Finance. The Ministry is commonly referred to as “Bercy,” which is the location in Paris of its offices. The division of the Ministry that is directly tasked with overseeing the national debt is called Direction générale des finances publiques or the General Directorate of Public Finances. The Directorate issues debt instruments through its sector, which is called Agence France Trésor, known as the AFP. How does the French government raise loans? The AFT raises money through debt by holding auctions of various types of investment instruments. The frequency of these auctions depends on the debt instrument being sold. These auctions are not open to the general public, or even to the business community as a whole. Only registered, approved Primary Dealers are allowed to bid for government debt instruments. 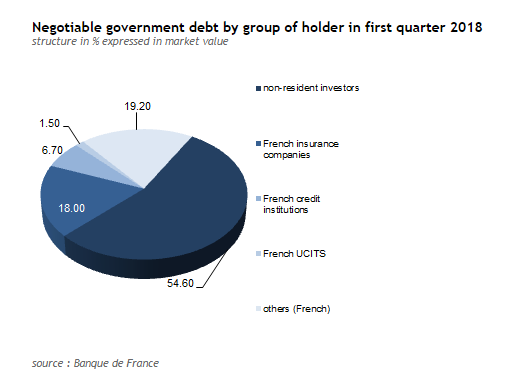 Other financial institutions, banks, and individuals can buy French government debt on the secondary market. When a primary dealer buys government securities, that business either already has customers lined up for the allocation, or buys them speculatively and resells them on the open market. What government securities does the AFT sell? You can read a little more about these strategies below. The short-term devices that the AFT sells are mainly in the form of Treasury bills. This is a very common type of debt instrument used by governments around the world. The typical characteristic of a Treasury bill is that it bears a maturity date of less than a year. Governments use Treasury bills to enable them to smooth out the irregular pace of their income streams. Governments have to have a regular income to pay bills and ages and the sporadic payment dates for taxes, duties and tariffs do not match up with the government’s schedule of obligations. Although Treasury bills are supposed to run for less than a year, most governments, including the French governments issue 1 year bills. In France, Treasury bills are called Bons du Trésor à taux fixe et à intérêts précomptés. This is abbreviated to BTFs. The AFT holds auctions of 13 week (3 month) BTFs every week on a Monday. They also issue 26-week and 52-week BTFs, but not as frequently. Despite the name, BTFs do not pay any interest. Instead, they are sold at a discount and redeemed at full face value. The long-term financing of the French government is now entirely funded through a device called Obligations assimilables du Trésor (OATs). In the past, the AFT issued a bond with a different name, which was Bons à Taux Annuel Normalisés (BTANS), but these have been discontinued. OATs are standard government benchmark bonds. They have a stated maturity date, which will be anywhere between 7 and 50 years. These devices pay the same annual interest rate for their lifetimes. The full face value of the OAT is repaid on the maturity date. TEC10 OATs are floating rate bonds that have a margin over the Base Rate. These OATs have a maturity of 10 years. The OATi is the French inflation-indexed bond. This is linked to the French Consumer Price Index, published by INSEE. The bond pays the same interest rate every year for its duration, but the face value gets recalculated each year to account for inflation. So, the interest amount paid rises with inflation even though the interest rate is constant. This is because the capital amount of the bond increase each year. The OAT€i is the same as the OATi, except the inflation index used to link the value of the capital amount is based on the Eurozone’s Harmonised Index of Consumer Prices (HICP) index, instead of the French INSEE calculation. The Green OAT was launched in 2017. This is a standard benchmark bond, except that the funds raised from these sales go into a reserved fund that is intended for the financing of environmentally-friendly government initiatives under the “Invest for the Future” program. By mid-2018, the French government owed 1,752 billion Euros. That debt incurs a cost. The AFT needs to find money to pay the interest on those debts and cover the costs of increasing the value of inflation-linked bonds. The AFT is not in a phase of paying off any debt at the moment, so the cost of repaying maturing bonds is covered by the issuance of new bonds. The table below shows the cost of maintaining France’s national debt. Figures shown are in billions of Euros. 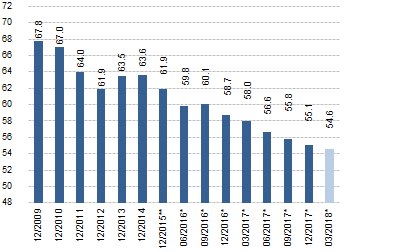 As interests have been stable for the years shown in the table, the above figures show that the cost of servicing France’s national debt have stabilized even though the actual amount owed keeps rising. Who owns France’s national debt? The largest source of funds for the French government are overseas traders, as the pie chart below shows. In the domestic market, the insurance sector is the largest holder of the governments debts. The inclusion of overseas traders in French government debt has been reducing gradually over the past decade, as the chart below shows. What facts should you know about France's national debt? You could wrap $1 bills around the Earth 10,585 times with the debt amount. If you lay $1 bills on top of each other they would make a pile 296,961 km, or 184,523 miles high. That's equivalent to 0.77 trips to the Moon.